Der Artikel Cheap Trick: On Top Of The World: 1978 Live Broadcast wurde in den Warenkorb gelegt. 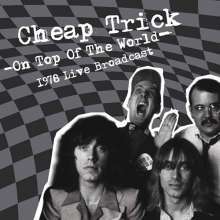 In 1978 Cheap Trick were at the top of their game, and this December broadcast recording catches them at razor-sharp rockin perfection. Two gigs at the 14, 000 seater Nippon Budokan arena in Tokyo were recorded in 1978 and put out as the Live at Budokan. Taken from the album, a live version of »I Want You to Want Me« became the groups biggest-selling single, reaching number 7 on Billboard.